e-prescribing from any EMR system and streamlines the Prescriber workload. PhyzData’s PTN solution delivers groundbreaking collaboration between patients, physicians, payers, specialty pharmacies, and manufacturers. 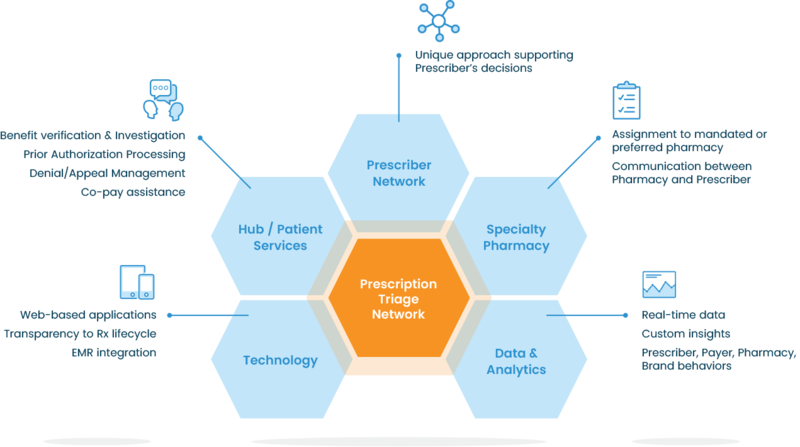 Our PTN enables access to patients and physicians by providing visibility across the entire Rx lifecycle. Given our unique access, we have the ability to redirect Physicians and SPs to PhyzHub or your preferred hub/partner to improve hub participation, patient adherence, and maximize drug utilization. We also offer manufacturer branding of our PTN technology platform to drive a unified brand message and value-add tool for your target Physicians. PhyzDataVault is our cloud solution designed to manage, monitor, and view specialty drug data and analytics in real-time. We are in sync and have a constant pulse with the Rx journey through its entire life-cycle. marketing to gain access and improve brand awareness and messaging for Physicians and pharmacists via PhyzNetwork and PhyzSP portals. Our solutions allows for manufacturer branding to drive a unified brand message to Physicians and Specialty Pharmacies that utilize our portal.